Occurrence: Chopped nuts in foods and as garnishes, nut spread. More information..
Nguyen and Gern (2003)  report a case in which cashew allergy was mistaken for foreign body obstruction. Subsequently the patient showed cough, stridor and hives. Hourihane et al. (2001)  report 29 patients with cashew nut allergy aged 1-30 years. 14 reacted to minimal contact without actually eating cashew. 14 reported wheeze and 11 reported collapse or feeling faint. Anaphylaxis (Strickler et al. 1986 ) and a case of fatal anaphylaxis (Sampson et al 1992 ) reported in reviews of anaphylaxis . Food/Type of allergen:Rance et al. (2003)  used commercial extracts. They also used cashew nut extracts for prick-prick tests. Rance et al. (2003)  tested 42 patients. Rasanen et al. (1998)  reported 1 patient. Rasanen et al. (1998)  reported an immediate wheal of 11mm, which grew to 20mm within 30min of SPT . Garcia et al. (2000)  tested sera from 3 patients. Rance et al. (2003)  tested sera from 42 patients. Teuber et al. (2002)  report 15 patients with a mean age of 39 years. All had required treatment after eating cashew nuts and were allergic to other nuts. Wang et al. (2003)  report 21 cashew allergic patients and 3 tolerant. Rance et al. (2003)  reported that 3/42 patients gave negative CAP assay but that 2 of these gave a positive open challenge and the third had a convincing history. Wang et al. (2003)  report positive CAP or RAST results from 21 cashew allergic adults and only one 0.43 kU/l response from 3 cashew tolerant patients. 13/21 sera reacted to a 33 kDa legumin identified as a new major allergen, Ana o 2. Teuber et al. (2002)  used 1D SDS-PAGE (13% polyacrylamide) with 5 minutes heating of cashew extract in sample buffer with or without DTT. 16% polyacrylamide tricine gels were also used to improve the resolution for low mass proteins. Wang et al. (2002)  and (2003)  used 1D SDS-PAGE on reduced cashew extracts or recombinant allergens using a 10% acrylamide gel. Teuber et al. (2002) , Wang et al. (2002)  and (2003)  transferred proteins to strips of 0.22-µm nitrocellulose, blocked with milk powder with Triton X-100 or Tween. Diluted sera (1:5 or 1:20) were added and incubated overnight at RT. The strips were then washed and incubated overnight at RT with equine polyclonal iodine 125I–labeled anti-human IgE diluted 1:5 in the nonfat milk buffer. Wang et al. (2002)  transferred proteins to Trans-Blot PVDF membrane (0.2 µm, BioRad) for sequencing. The 2S albumins and legumin-like 13S proteins were identified as major allergens and a vicillin was also identified as an allergen by Teuber et al. (2002)  . Wang et al. (2003)  report that 13/21 sera reacted to a 33 kDa legumin identified as a new major allergen, Ana o 2. Hourihane et al. (2001)  report positive open challenge on 2 patients with cashew nut allergy. Extracts from the botanically closely related plant pistaccio also bind IgE from several cashew allergic patients at similar masses and were also sensitive to reduction (Fernandez et al. (1995) ; Garcia et al. 2000 ). Rance et al. (2003)  found that 7/42 of their patients were also allergic to pistaccio. Teuber et al. (2002)  report that their patients cross reacted to walnut but note that this could result from bias as they had started from prodominately walnut allergic patients. Many studies report allergy to "tree nuts". Allergy to cashew was the second most common of the tree nuts reported by Sicherer et al. (2001)  with 20% of the 1667 nut allergic registrants reporting cashew allergy. Similarly Sicherer et al. (1998)  report 11/54 nut allergic patients as cashew allergic. However, the symptoms, described as 89% involved the skin (urticaria, angioedema), 52% the respiratory tract (wheezing, throat tightness, repetitive coughing, dyspnea), and 32% the gastrointestinal tract (vomiting, diarrhea) were not associated with specific nuts. Clark and Ewan (2003)  report 29/1000 peanut or nut allergic patients showed their strongest reaction to cashew (however, the number of patients who tolerated cashew was not reported). Wei et al. (2003)  report development of an ELISA for analysing cashew in food. Rasanen et al. (1998)  report moderate inhibition of IgE binding to cashew nut extract by pectin in one patient, determined by RAST. Moneret-Vautrin et al. 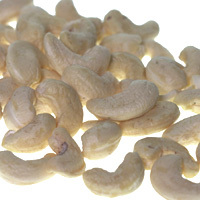 (1998)  reported 40% of 140 peanut allergic patients were sensitised to cashew. Tariq et al. (1996)  reported that 1/1218 of a birth cohort (0.08%) was allergic to cashew. 26.04% of patients in a food allergy clinic in India (Mumbai) reported allergy to cashew (Suraiya 1999 ). Teuber SS, Sathe SK, Peterson WR, Roux KH. Food allergy masquerading as foreign body obstruction. Garcia F, Moneo I, Fernandez B, Garcia-Menaya JM, Blanco J, Juste S, Gonzalo. Allergy to Anacardiaceae: description of cashew and pistachio nut allergens. Rance F, Bidat E, Bourrier T, Sabouraud D.
Cashew allergy: observations of 42 children without associated peanut allergy. Allergy to pistachio: crossreactivity between pistachio nut and other Anacardiaceae. Pectin and cashew nut allergy: cross-reacting allergens? Wang F, Robotham JM, Teuber SS, Tawde P, Sathe SK, Roux KH. Hourihane JO, Harris H, Langton-Hewer S, Kilburn SA, Warner JO. Clinical features of cashew allergy. Sampson HA, Mendelson L, Rosen JP. Fatal and near-fatal anaphylactic reactions to food in children and adolescents. Moneret-Vautrin DA, Rance F, Kanny G, Olsewski A, Gueant JL, Dutau G, Guerin L.
Food allergy to peanuts in France--evaluation of 142 observations. Allergen epitopes:11 epitopes were detected by Wang et al. (2002)  with 3 immunodominant epitopes corresponding to AIMGPPTKFSFSLFL 1-15; KECEKYYKEKKGRER 57-71 and EEFFFQGPEWRKEKE 521-535. Nature of main cross-reacting proteins:Pistachio proteins at 34, 41, 52 and 60 kD cross-react with cashew extract by CAP-inhibition but were not identified (Parra et al. 1993 ). Thus Pistachio 7S may cross react. Allergen properties & biological function:7S seed storage protein. The 62 kD sucrose binding proteins of soya are also closely related in sequence. Parra FM, Cuevas M, Lezaun A, Alonso MD, Beristain AM, Losada E.
Pistachio nut hypersensitivity: identification of pistachio nut allergens. Allergen epitopes:Wang et al. (2003)  analyzed the IgE binding of 3 pools of 4 sera from 12 patients to 58 overlapping linear peptides. 86% of the IgE binding was to the N-terminal acidic 66% of the protein (heavy subunit). Only 2 epitopes, 15-29 SRQEWQQQDECQIDR and 105-119 YQAPQQGRQQGQSGR, were recognised by IgE from all 3 pools. Only 7 epitopes bound IgE strongly from any one pool. There was little similarity to the epitopes of Ara h 3. Soya glycinin was more similar. One cashew epitope, 233-247, is positionally related to epitopes from glycinin and Ara h 3. Nature of main cross-reacting proteins:Pistachio proteins at 34, 41, 52 and 60 kD cross-react with cashew extract by CAP-inhibition but were not identified (Parra et al. 1993 ). Thus Pistachio 11S may cross react. Allergen properties & biological function:The 13S storage globulin of cashew, originally called anacardein, is synthesised as approximately 55 kDa chains (as, for example, proglycinin) which form trimers. On cleavage into 30-35 kDa N-terminal heavy subunits and 20-27 kDa C-terminal light subunits, which remain disulphide linked, the trimers form a hexamer of about 330 kDa. Whole raw cashew nuts were ground in a blender and defatted with cold acetone. The defatted flour was extracted with 0.1M Tris-HCl, pH 8.1, and subjected to anion exchange on DEAE DE-53 (Whatman) and gel filtration (Sephacryl S300) (Teuber et al. 2002) . Wang et al. (2003)  report preparation of recombinant Ana o 2 as a fusion protein in Escherichia coli that was cleaved to a 52 kDa protein. This is similar to the native precursor after removal of the leader peptide but is unlikely to form native oligomers. Other biochemical information:The sequence Q8GZP6 lacks the signal sequence of the protein. There are also small differences compared to the peptides sequenced by Teuber et al. (2002) , suggesting that this may be a multigene family. Process, chemical, enzymatic:2S albumins are disulfide cross-linked and are often relatively stable to proteolysis.